It seems to be the season for the discovery of sensational portraits. A few days ago The Shakespeare Birthplace Trust announced having found an authentic, contemporary portrait of none less than Shakespeare himself. 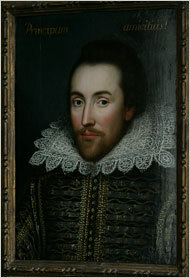 Its persuasive provenance and resemblance to a number of portraits, most presumably copied from lost pictures, that carry traditional identifications to Shakespeare, has convinced the Trust’s Chairman, the distinguished Shakespeare scholar Stanley Wells that it is almost certainly the only authentic image of Shakespeare made from life. The attractive portrait belongs to the Cobbe family and has called Newbridge House, outside Dublin, its home for centuries. It was supposedly painted around 1610 when Shakespeare was 46 years old. As mentioned, several pictures assumed to be copies of lost paintings from that time, most notably a panel in the Folger Shakespeare Library in Washington DC, carry traditions identifying their sitter as Shakespeare dating back within living memory of his life. Equally important to its pedigree is it provenance, which can apparently be traced with reasonable certainty to Shakespeare’s only literary patron, Henry Wriothesley, the 3rd Earl of Southampton. All of this is very convincing. Not having seen the picture in the flesh and not being an expert on either Shakespeare or 17th-century portraiture in Britain, my opinion carries little weight, but I would nevertheless advise caution here. There are several problems as I see it. Most importantly, the man portrayed does not look a whole lot like the most reliable portrait we have of Shakespeare, Martin Droeshout’s famous engraving published with the First Folio edition of his dramatic works in 1623. 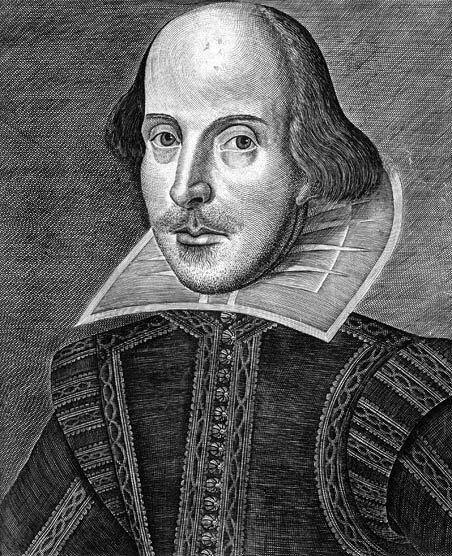 Although engraved posthumously by somebody who cannot have known Shakespeare personally, we must assume this portrait to have been engraved after an authentic portrait and its likeness accepted by its patrons, who certainly knew him. The men portrayed in the two works are different in almost every way — the shape of their skulls, the curves of their mouths, the arc of their noses, their hairlines. Granted, the Cobbes portrait is probably more than a little idealised and a certain measure of likeness might very well have been lost in the translation between the lost model and the somewhat naïve engraving. But still, the difference is remarkable. And in any case, the engraving certainly cannot have been executed after the Cobbes portrait as Wells suggests. 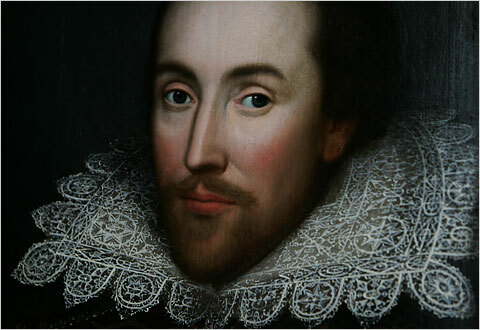 It’s a seductive thought, however, that this attractive portrait represents the likeness of the Bard. I kind of want it to be him too. Maybe it is him? er det en forfalskning? is it a false picture? han er lidt for “pæn”. Kan det være en forskønnet udgave der tager udgangspunkt i de to andre portrætter? There’s an interesting refutation by Katherine Duncan-Jones of the theory that the Cobbe picture portrays Shakespeare in the TLS this week. She makes a very good case that the sitter might be a Sir Thomas Overby. While I agree that the case for Shakespeare is, well, shaky, I’m also skeptical about her Duncan-Jones’ identification. To my eyes, the authentic portrait of Overby at the Bodleian Library at Oxford shows a different man and a painter as skillful as the one who did the Cobbe portrait would have captured the likeness better. Especially the nose is clearly different. Of course, if he were working after an inferior model–he certainly wasn’t painting after the Bodleian picture as Duncan-Jones contends–it might be possible, but I’m still uneasy about it.